A friend of mine planned a romantic spa getaway with her husband but wound up disappointed. Once they checked into the spa, they never saw each other again until it was time to pay the bill because there were separate men and women's lounges. If they had just asked if there were couples treatments or co-ed lounges, they could have gotten around this problem. Another time I was at a fasting detox spa that didn't even have a kitchen because all we ate were detox drinks and raw soups. A couple googled "spas", found it, and came for a romantic getaway without knowing it was all about the detox. Were they disappointed? Yes. The important point is that you need to ask questions. There are a lot of resort spas that pride themselves on providing a romantic experience. To make sure you get what you're paying for, ask these questions before you make your reservations. Does your spa have a co-ed waiting area? Romantic spas have a co-ed lounge where you can meet in your robes before and after your spa treatments . This is especially romantic if they have a cozy fireplace or Jacuzzi, like the Spa at Mohonk Mountain House in New Paltz, New York. If the waiting areas are completely separate, you might not see your beloved after you say goodbye at the front desk. Most resort spas (even many day spas) have special treatment rooms big enough for two people to get a massage at the same time. Do you have a couples suite? The most romantic spas have lavishly equipped couples suites where you get your treatments together and lounge in private for a while afterwards. These suites are packed with amenities like fireplaces, pedicure chairs, steam showers and lounging beds. They can be indoor, outdoor or even have both indoor and outdoor rooms. A good example is the VIP Suite at The Spa at Mandarin Oriental, New York. 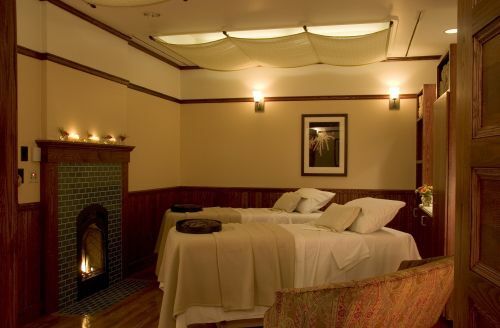 In smaller spas or day spas the couples suite might just be a large treatment room. Can we get massage in our room? Some spas, like and The Cliff House in Ogunquit, Maine, have oversized rooms or spa suites big enough to bring two massage tables in for couples massage in your room. It’s the ultimate in romantic privacy. Do you have any romantic spa packages or services aimed at couples? Some spas, like The Spa at Harbour Inn in St. Michaels, Maryland have special services aimed at couples. You Order a “Bath Before Bed” – a rose petal bubble bath with candles and a bottle of Champagne -- and enjoy the view by night. If you’re not sure where you want to go, surprise your loved one with a spa gift certificate. If it's your first time at the spa , , spa treatments , different types of spas and saving on your spa vacation.